Discussion in 'Xbox 360 Modding Tutorials' started by EclipseModz, Dec 12, 2009 with 2,352 replies and 1,496,315 views. Xbins will be needed to download programs for this TUT. Thanks to halolordkiller3 you can now download this as a .PDF file. Since the diagram only shows how to tell the Generation this is how you tell what you have. 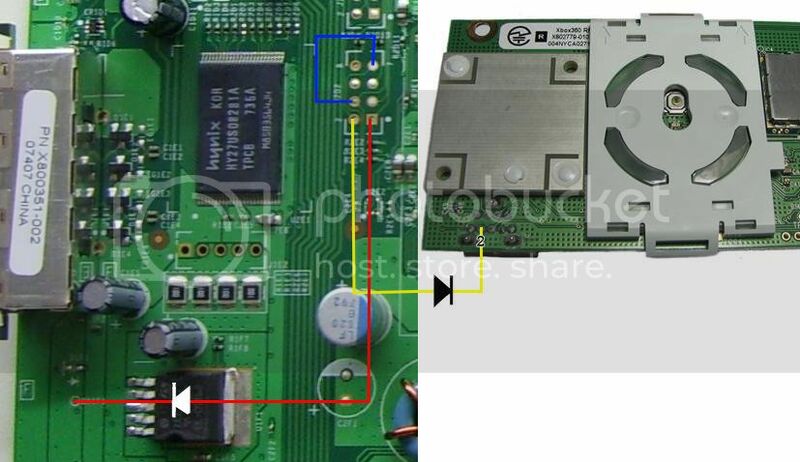 You will need to know your Xbox Motherboard Revision. These are the two diagrams to follow. Each one of these will need to be bridged with a piece of wire and 2 of them require a switching diode. The |< is where the diodes go. On the diode itself there is a thick black line. That black line is this side ---> |< of the diode. That will tell you which way to place the diode when installing the JTAG connections. Diode MUST be soldered directly to the board facing the correct way. Alright now that you have the JTAG connections out of the way its time to install the LPT cable. You will need the following to dump your Xbox 360 NAND. - LPT cable with a DB25 Male end. Now dumping your NAND is crucial to this. 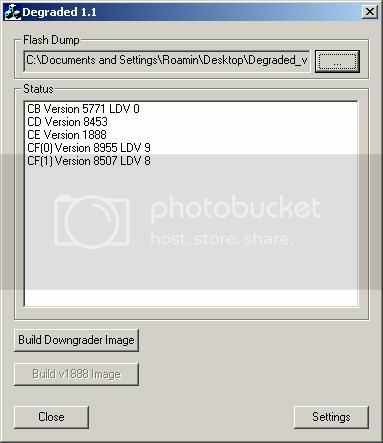 You want to have a good clean NAND image that can be flashed back to the console if need be. So lets get started. 1. We need to set up the solder connections onto the motherboard. I used a printer cable and cut it midway and spliced it open. Then used a multimeter to figure out which cable goes to which pin. I then wrote the color/pin combination on a piece of paper. If you decide to do the same as me and not make your own cable I suggest writing down the color/pin combo so you don't have to use the multimeter again. This is what my printer cable looks like. 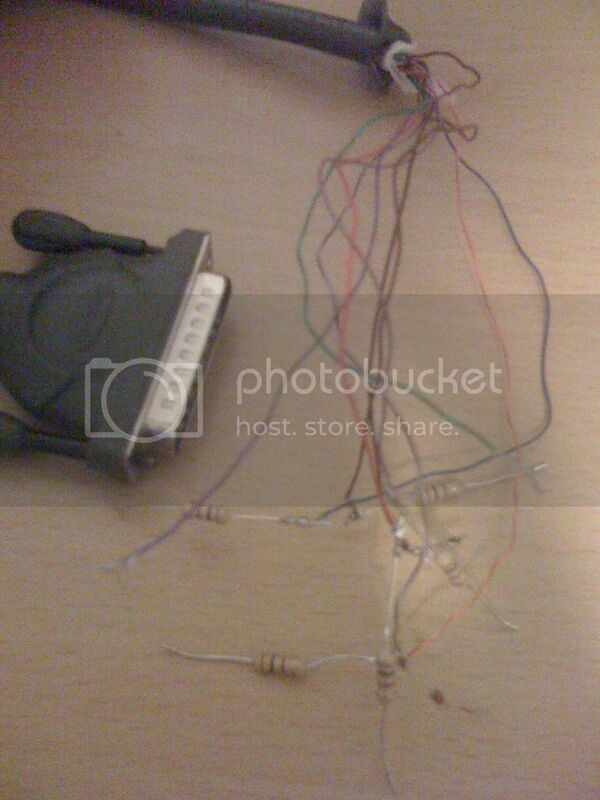 As you can see I have all the resistors soldered to the ends of the cable and the one diode attached as well. All I have to do is solder it to the motherboard and I have my connection to the NAND reading and it can dump. Soldering the cable to the board. NOTE: This will make it a lot easier for you that do not solder the resistors to the board and have made your own lpt cable. This will solve most of your "Could not detect flash controller" errors. 1. Cut spare resistor stems off. 2. Cut those stems in half. 3. Wrap the end of your wire from the lpt cable around the stem and solder the stem and wire togehter. 4. Now Solder that stem INSIDE the hole on the motherboard. Not on top but actually letting it sink inside the point. LPT Connections are the same for every single board. There is not difference. 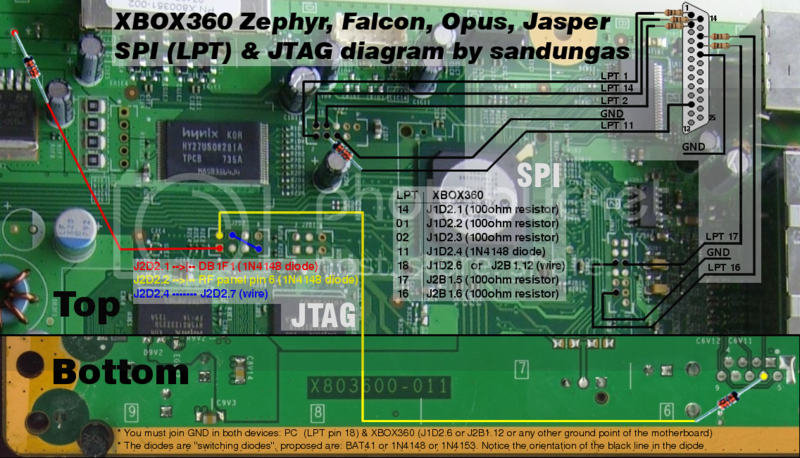 This picture names those motherboards because of the JTAG points that are in the picture. Disregard that. LPT connections are the same for ALL boards! Pin number 18 coming from the LPT cable is shown as ground. This wire should be soldered to either the ground next to where Pin 11 solders to or the ground under where Pin 16 solders to. This will ground it and prevent the 360 from shorting and turning off. Ok so now that you have the LPT cable soldered to the motherboard and have your cable connected to your PC. It is time to start dumping the NAND. In order to dump the NAND you will need Nandpro20b which can be downloaded on Xbins. 1. Make a new folder and name it Nandpro20b then extract the content of the rar file into this folder. 2. Place the Nandpro20b folder in the root directory of your hard drive. 3. In the Nandpro20b folder there is a prgram called "port95nt.exe" run that to install the drivers. Then you are ready. NandPro should work with all 32bit OS's. It is said it works fine with Vista and 7 but may need admin rights and XP Compatibility on. Anyway lets get to reading your NAND. Plug the power cable into the back of the 360 and into the wall so it has its power source. But do not turn on the 360 as it is not required. All you need to do is plug in the power cable and continue. 4. Now in the command window you will need to type the command to read. For Jasper's with 256mb Internal memory. For Jasper's with 512mb Internal memory. 5. Click enter and it should start. If it says testing 4 times and fails you need to check your soldering. 6. If done right it will start to read the NAND. It should read to block 3FF. 7. Repeat step 4. You want to have at least 2 dump to compare to each other and make sure they are identical. *Note that it is possible that your NAND has bad blocks in it. 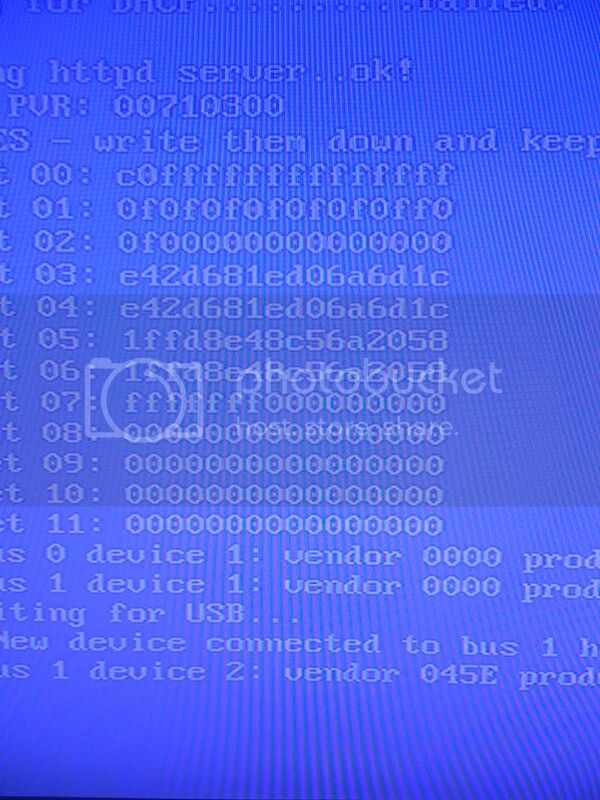 Error(25x) and you keep getting this each time you dump the NAND don't worry. It is safe to continue because that is just how your NAND image is. How to check if your NAND dumps are identical. 4. A new window will open. Open on nand dump for file one and open the second dump for file 2. 6. If it says file are identical you are set to continue. If it does not say that. I suggest you go back and dump 1 or 2 more times. If your two dumps are identical. Congratulations. You have successfully dumped your Xbox 360 NAND. Now you can continue. This is a very important step for 360's with the 7371 kernel. Some of these 360's have been patched already to stop the JTAG hack. This is the way to make 100% sure whether or not your 360 is still vulnerable. Your CB version will be displayed. NAND wont open in Degraded? Here is how to fix that. 5) Now you image will open in Degraded. For Big Block consoles. Degraded will not open your image. Xell is used to grab your CPU Key for your console. Which is a good thing to have in case you need to open your KV. Install Xell is easy and takes little to now time. This is not needed to install XBR. XBR already has Xell integrated with it. This is for the people that just need their CPU key to decrypt their KV to get their DVD key. XBR 3 will start Xell if you start the 360 with the eject button. First you will need to download it from Xbins. Again here is the directory. With your LPT cable and everything still set up. You will be using nandpro again. So here we go again. Don't worry about the file size. It is meant to only write to the beginning of your NAND flash. 5. Click enter and it should starting writing. 6. Once it is done writing. Unplug the lpt cable from the PC and turn on the 360. It should boot into a blue screen. If it does then you did it right. Have a camera ready to take a picture of the Fuse Set's that pop up briefly. Take a picture that includes fuse set 3,4,5,and 6. These contain your CPU key. Take either 3 and 5 or 4 and 6. This will make up your cpu key. 3=4 5=6 So for example. I will take 3 and 5. Adding either one of the two will make your CPU key. After getting your cpu key you can write your original nand image back to the board. Or go straight forward and install XBReboot or freeBOOT. Will be added very soon! Typed by me, diagrams taken off Free60. How to dump your nand! (Corona ONLY I think). How to Use Nand-X to Jtag Your Xbox! You can dump the NAND of any 360 regardless of what dashboard version it has. 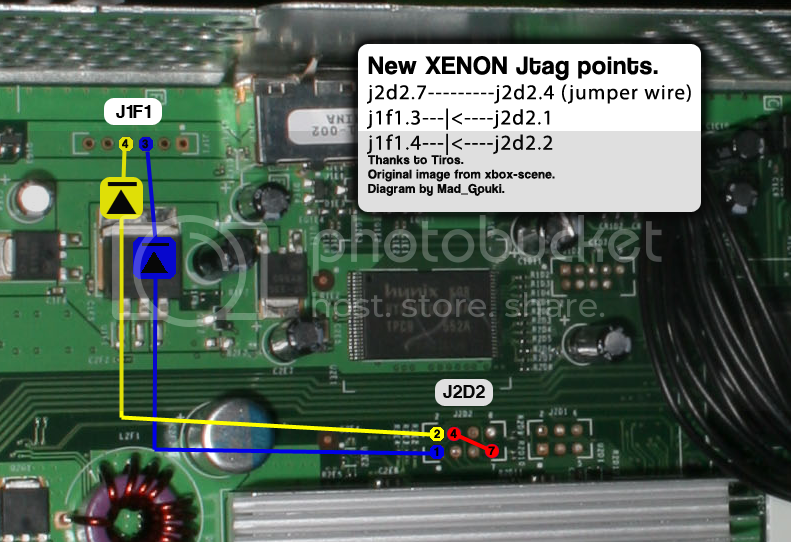 Also the JTAG connections are not needed to dump the NAND either. I just put the JTAG hack before reading the nand. i actually have the same exact printer cable as you, so could you just tell me what color wires or whatever to put the resistors on? Not 100% sure. IT may work. There is nothing hard about typing a command. ok I put resistors on the first 5 wires, and then realized that there is two more pins there than there are supposed to be. Which one(s) do I put a switching diode on? which ones do I put resistors on? edit 2: what do I do with pin 18, it just says to "screwhole" or something, what does that mean? Look on the diagram. Solder it to a ground from a board. I solder it to the ground hole below where pin 16 solders. So does that mean you can swap KV without actually doing the JTAG? If you have your CPU key yes. No, as you need your CPU key to swap KV's and you cant get that without the JTAG hack and Xell. You can't swap the KV on the newer 360's because of the signature on the KV. what if it says "could not detect a valid flash controller"
Check your soldering. Make sure you install it right. Also make sure you have the power cable plugged into your 360. Forgot to put that in there. Fixed. This is sick if only i had an exploitable xbox . Is it possible to make a tutorial on how to build an XBReboot image? Are you using the belkin printer cable?